In my last blog we talked about issues around loss and helping children cope. I’ve recently discovered a gem and want to share it with you. 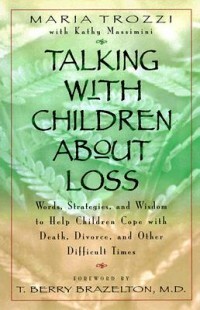 Grief specialist Maria Trozzi’s book, Talking with Children about Loss, provides countless resources and strategies for families to utilize when addressing this topic with children. Death and loss are often taboo subjects, avoided by many, uncomfortable at best for most. We use vague words in describing death, such as passed on, went away, went to heaven, not with us anymore, put to sleep, passed away, moved on. These are, in fact, very unclear and confusing terms for children. They’re simply euphemisms for death that help us deal with our own discomfort.This book helps us get beyond the cultural taboos and the euphemisms. Trozzi offers guidance for discussing the issues with children, while respecting each individual’s unique spiritual or religious beliefs. She helps us understand children and adolescents’ developmental processes in dealing with grief so that we can better grasp what to expect and how best to support the emotions and behavior when they arise. I cannot recommend this captivating, easy-to-read, heartfelt book enough for any family who is, has or will eventually deal with a loss of some sort.